I recently interviewed over 200 ultra-productive people including 7 billionaires, 13 Olympians, 20 straight-A students and over 200 successful entrepreneurs. I asked a simple, open-ended question, "What is your number one secret to productivity?" After analyzing all of their responses, I coded their answers into 15 unique ideas. Average performers default to hours and half-hour blocks on their calendar. Highly successful people know where are 1,440 minutes in every day and there is nothing more valuable than time. Money can be lost and made again, but time spent can never be reclaimed. As legendary Olympic gymnast Shannon Miller told me, "To this day, I keep a schedule that is almost minute by minute." You must master your minutes to master your life. Ultra productive people know their Most Important Task (MIT) and work on it for one to two hours each morning, without interruptions. Tom Ziglar, CEO of Ziglar Inc., shared, "Invest the first part of your day working on your number one priority that will help build your business." What task will have the biggest impact on reaching your goal? What accomplishment will get you promoted at work? SECRET #3: They don't use to-do lists. Throw away your to-do list; instead schedule everything on your calendar. It turns out only 41% of items on to-do lists are ever actually done. And all those undone items lead to stress and insomnia because of the Zeigarnik effect. Highly productive people put everything on their calendar and then work and live from that calendar. "Use a calendar and schedule your entire day into 15-minute blocks. It sounds like a pain, but this will set you up in the 95th percentile...", advises the co-founder of The Art of Charm, Jordan Harbinger. Your future self can't be trusted. That's because we are "time inconsistent." We buy veggies today because we think we'll eat healthy salads all week; then we throw out green rotting mush in the future. I bought P90x because I think I'm going to start exercising vigorously and yet the box sits unopened one year later. What can you do now to make sure your future self does the right thing? Anticipate how you will self-sabotage in the future, and come up with a solution to defeat your future self. I first learned this from Intel's Andy Grove, "There is always more to be done, more that should be done, always more than can be done." Highly successful people know what they value in life. Yes, work, but also what else they value. There is no right answer, but for many, values include: family time, exercise, giving back. They consciously allocate their 1440 minutes a day to each area they value (i.e., they put it on their calendar) and then they stick to the schedule. Richard Branson has said on more than one occasion that he wouldn't have been able to build Virgin without a simple notebook, which he takes with him wherever he goes. In one interview, Greek shipping magnate Aristotle Onassis said, "Always carry a notebook. Write everything down... That is a million dollar lesson they don't teach you in business school!" Ultra-productive people free their mind by writing everything down. Ultra-productive people don't "check" email throughout the day. They don't respond to each vibration or ding to see who has intruded into their inbox. Instead, like everything else, they schedule time to process their email quickly and efficiently. For some that's only once a day, for me, it's morning, noon and night. When I asked Mark Cuban to give me his best productivity advice, he quickly responded, "Never take meetings unless someone is writing a check." Meetings are notorious time killers. They start late, have the wrong people in them, meander in their topics and run long. You should get out of meetings whenever you can, hold fewer of them yourself, and if you do run a meeting, keep it short. SECRET #9: They say "no" to almost everything. Billionaire Warren Buffet once said, "The difference between successful people and very successful people is that very successful people say 'no' to almost everything." And James Altucher colorfully gave me this tip, "If something is not a "hell, YEAH! Then it's a "no!" Remember, you only have 1440 minutes in every day. Don't give them away easily. 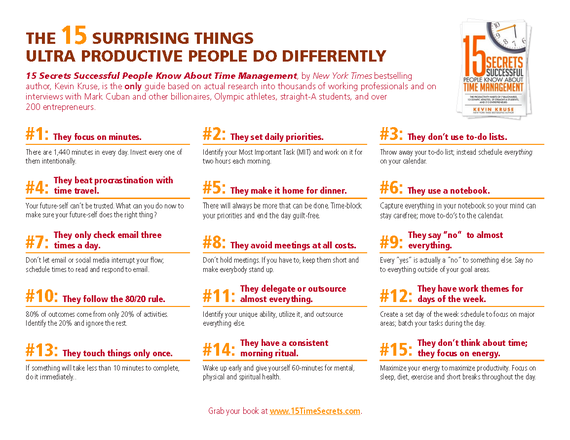 Ultra-productive people don't ask, "How can I do this task?" Instead they ask, "How can this task get done." They take the "I" out of it as much as possible. Ultra-productive people don't have control issues and they are not micro-managers. In many cases good enough is, well, good enough. Highly successful people often theme days of the week to focus on major areas. For decades I've used "Mondays for Meetings" and make sure I'm doing one-on-one check-ins with each direct report. My Friday afternoons are themed around financials and general administrative items that I want to clean up before the new week starts. I've previously written about Jack Dorsey's work themes, which enable him to run two companies at once. Batch your work to maximize your efficiency and effectiveness. How many times have you opened a piece of regular mail -- a bill perhaps -- and then put it down only to deal with it again later? How often do you read an email, and then close it and leave it in your inbox to deal with later? Highly successful people try to "touch it once." If it takes less than five or ten minutes -- whatever it is -- they'll deal with it right then and there. Reduces stress since it won't be in the back of their mind, and is more efficient since they won't have to re-read or evaluate the item again in the future. My single greatest surprise while interviewing over 200 highly successful people was how many of them wanted to share their morning ritual with me. Hal Elrod, author of The Miracle Morning, told me, "While most people focus on 'doing' more to achieve more, The Miracle Morning is about focusing on 'becoming' more so that you can start doing less, to achieve more." While I heard about a wide variety of habits, most people I interviewed nurtured their body in the morning with water, a healthy breakfast and light exercise. They nurtured their mind with meditation or prayer, inspirational reading, and journaling. You can't make more minutes in the day, but you can increase your energy which will increase your attention, focus, decision making, and overall productivity. Highly successful people don't skip meals, sleep or breaks in the pursuit of more, more, more. Instead, they view food as fuel, sleep as recovery, and pulse and pause with "work sprints". You might not be an entrepreneur, Olympian, or millionaire -- or even want to be -- but their secrets just might help you to get more done in less time, and help you to stop feeling so overworked and overwhelmed.